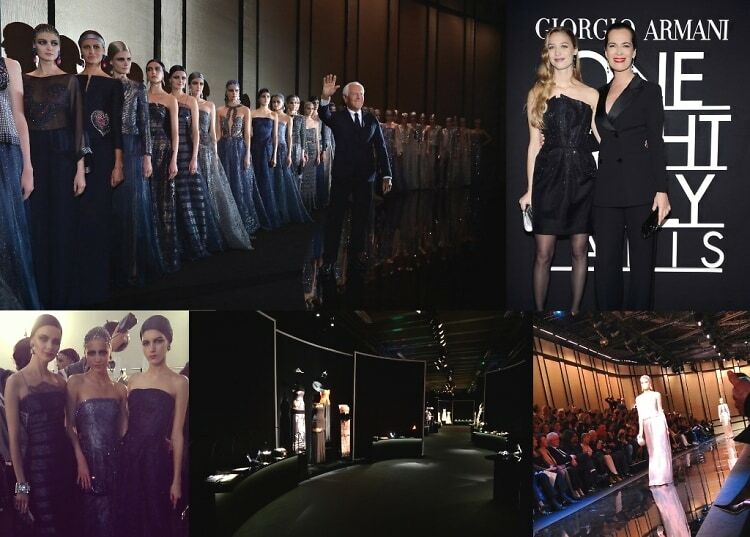 Go HERE for more photos from Giorgio Armani "One Night Only" Paris! Last night in Paris, Giorgio Armani made a splash at Couture Week with the "One Night Only" event featuring his Giorgio Armani Privé Spring/Summer 2014 presentation. The event, which has been held in London, Beijing, Rome, and Tokyo in the past most recently made its way to New York in September, where the Privé collection was presented to Leonardo DiCaprio, Anna Wintour, Martin Scorcese, and many more. This time around, the collection and the Eccentrico exhibition were displayed for guests including Kristen Scott Thomas, Isabelle Huppert, and Ziyi Zhang at the Palais de Tokyo. As suggested by the title of the collection, "Nomad," the clothing had a range of global influences, with Eastern, African, and European touches underlining each look. Following the show, guests observed Armani's retrospective exhibition "Eccentrico" featuring a selection of the designers best dresses and accessories. The night ended with a special dinner prepared by chef Davide Oldani. Who was there: Guests included Giorgio Armani, Anna Wintour, Kristin Scott Thomas, Sophie Marceau, Christopher Lambert, Ziyi Zhang, Livia Firth, Isabelle Huppert, Stefano Tonchi, Derek Blasberg, Paloma Faith, Hamish Bowles, Caroline Issa, Olivier Zahm, Kristina O'Neill, Edward Enninful, Anna Dello Russo, Elizabeth Debicki, Suzy Menkes, Loic Prigent, Chiara Mastroianni, Beatrice Borromeo, Pierre Casiraghi, Claudia Cardinale, Elena Perminova, Alain-Fabien Delon, Tallulah Harlech, Tamsin Egerton, Jennifer Neyt, Xavier Romatet, Fabiola Berecasa, Afef Tronchetti Provera, Alice Taglioni, Ray Chen, Luca Guadagnino, Maribel Verdu, Miguel Angel Silvestre, and Roberta Armani.